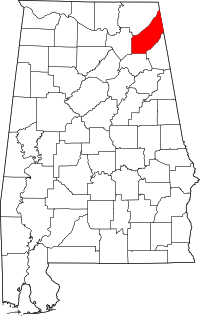 DeKalb County was created by the Alabama legislature on January 9, 1836 from land ceded to the Federal government by the Cherokee Nation. It was named for Major General John Baron DeKalb, a hero of the American Revolution. DeKalb County is located in the northeast corner of the state, and is bordered on the north by Jackson County, on the west by Marshall County, on the south by Etowah and Cherokee counties, and on the east by the State of Georgia. The county seat is Fort Payne. ~ Source: Ancestor Swap Meet 2003 book, June 21, 2003, Northeast Alabama Genealogical Society. Crossville is a small town in an area known as Sand Mountain in Northeast Alabama, and it is known for its history and tradition. Read more here. Collinsville was first a settlement located in the fork of Little Wills Creek and was known as Lynchburg before it became Collinsville. The town was once the land of the Cherokees & has a rich history. Read more here. Other towns and communities include Fyffe, Mentone, and Valley Head. The Historic Willstown Cemetery – A Wills Town Mission was established in 1823. “The cemetery may predate the mission/school. … The cemetery was also used as a flower garden by the missionaries …” This site is rich in information about this cemetery. History of Fort Payne – Fort Payne has a rich and intriguing history. DeKalb County has an active genealogical society in Fort Payne. Their website at http://dekalbsociety.freeservers.com is no longer online. We hope they contact us when they have another site. ~ Updated 4/30/2015. Nichols Library has several books on DeKalb County including information on cemeteries, schools, and church records. A concise but detailed history of the county from its beginning is in the Heritage of DeKalb County, Alabama. The volume includes short family histories as well as an Indian [Cherokee] Census taken in 1835. Book includes an index. The library has both volumes. Facebook Group: If you are on Facebook, see the DeKalb County, Alabama Genealogy group. This group is OPEN which means you do not need to JOIN to view its content. However, you will have to remember to check is and bookmark the link. Once you JOIN the group, any updates will be appear on your Facebook page. ~ posted September 11, 2013 11:06:19 AM. DeKalb County Page Maintainer: Position Open. Use the Contact Us form to volunteer.